• Subdued USD demand lends some support. • Risk-off mood provides an additional boost. • Fed rate hike prospects to cap strong gains. Gold consolidated Friday's downfall to over 2-week lows and was seen oscillating in a narrow trading band around the $1330 region. 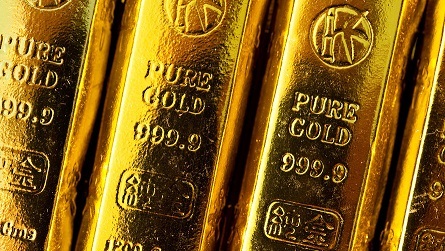 Friday's robust US jobs data raised prospects of at least three rate hike moves by the US Federal Reserve and prompted some aggressive selling around the non-yielding yellow metal. The US Dollar rebound, however, lacked any strong follow-through traction at the start of a new trading week and was eventually seen lending some support to dollar-denominated commodities - like gold. Adding to this, a fresh wave of global risk aversion trade, as depicted by a selloff across equity markets, underpinned demand for traditional safe-haven assets and further collaborated towards limiting any further downside. Later during the early NA session, the release of US ISM non-manufacturing PMI, the key highlight of today's US economic docket, would now be looked upon for some fresh trading impetus. Immediate support is pegged near the $1328-26 region, which if broken could accelerate the fall towards $1320 horizontal level en-route $1312 important support. On the upside, any meaningful bounce is likely to confront immediate resistance near $1337 level, above which the commodity could head back towards testing $1350 supply zone.